These brackets are made exclusively by VMGP as a 4-part brass fabrication in order to produce a high quality chrome finish. This style of bracket was fitted to the windscreen pillar on the D/J1/F1/F3/L1 and certain racing models. The J4 bracket we also manufacture is taller to clear the windscreen B-nut with a height of 3 3/8 inch from the base to the centre of the boss. No J4/Rep is complete without this distinctive style of bracket. The smaller bracket has a height of 2 1/4 inch and the base centre distance for each size of bracket is 3 inch. The larger bracket has a radiused end profile to its base whilst the majority of the smaller brackets tended to be more squared off although we usually have a few of each in stock relating the the smaller bracket. 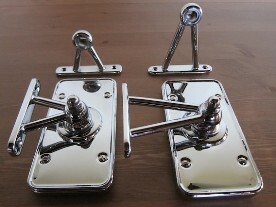 These brackets can be used with the Lucas style 160 type mirror and the smaller K3/Q mirror. Other associated products include scuttle and horn button mounted mirrors.